The Start menu made its triumphant return in Windows 10 after being jettisoned in Windows 8 and 8.1. 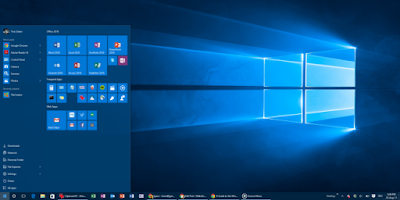 But the Windows 10 Start menu is not as user friendly as the one in Windows 7 when it comes to organizing and arranging folders and shortcuts. By default, the Windows 10 Start menu's All Apps list shows you every item that's been installed, including readme files, uninstall options, and About features. At first glance, there seems no way to unclutter the menu by reducing the number of folders, deleting shortcuts, or moving shortcuts into different folders. But hold on, we're not defeated. You can indeed clean up the All Apps list to a certain degree if you know how. Two areas hold the folders and shortcuts for all desktop applications that appear in the Start menu's All Apps list. Accessible through File Explorer, the first area contains folders and shortcuts for software installed just for your own Windows account. The second area contains folders and shortcuts for software installed for all accounts. But we're going to move all the folders and shortcuts from the window for your account into the All Users window so we have one central location from which to organize and arrange them. In the first window, right-click on the Programs folder and click Cut from the pop-up menu. Move to and right-click in the other window and click Paste from the menu. Click Continue if asked to provide administrator permission to move to this folder. Click the option to "Do this for all current items." Now we can work directly from the C:\ProgramData\Microsoft\Windows\Start Menu. Close the first window and maximize the second window. Open the Programs folder in this window. You should see all the folders and shortcuts for all your installed software programs. Now think about how you'd like to arrange all these folders and shortcuts. Instead of having a separate folder or location for each individual program, maybe you'd like to create single folders that house several shortcuts. For example, rather than maintain separate locations for Internet Explorer, Firefox, Google Chrome, and Opera—all four of which you use—let's create one folder called Web Browsers that can store the shortcuts for all four browsers. Right-click on any empty area in the File Explorer window, move to the New command from the pop-up window, and select Folder. Name the folder Web Browsers. Cut the shortcut for Google Chrome and paste it into the Web Browsers folder. Do the same for the shortcuts for Firefox and Opera. Finally, move to the Windows Accessories folder, cut the shortcut for Internet Explorer, and paste it into the Web Browsers folder. Now click on the Start menu, and you should see your new Web Browsers folder. Open that folder to display the shortcuts for your four browsers. Here's another option. Create a folder called Entertainment and move the shortcuts for all your entertainment-related programs into it, such as iTunes, Windows Media Player, Movie Maker, and Photo Gallery. After you move the shortcut for iTunes, you can delete the iTunes folder since you no longer need it. ontinue in this same manner, with a couple of caveats. You can't create or move subfolders into parent folders in the All Apps list. Neither can you move Windows apps into different folders. Windows apps are stubborn and insist on staying right where they are. But at least you can move your individual shortcuts into other folders and arrange the shortcuts for your desktop applications. So here's the basic MO: Create folders to store several shortcuts for related desktop programs; delete the old folders for those shortcuts; when done, click on the Start menu, and you should find your folders and shortcuts better organized, less cluttered, and easier to navigate.